Email marketing is still the most effective way to reach customers. Strategic segmentation is a critical part of making your email marketing campaigns as effective as possible. Your email subscribers expect personalization, and they can tell immediately (and clearly won’t like it) when they receive an irrelevant mass message blast. Ultimately, your contacts want to receive relevant content, and you can’t provide that to them if you have a one-size-fits all approach to your emails. So, how are you supposed to segment your email lists? Knowing your subscribers’ geographic regions is critical knowledge for segmentation. If your business is consistently sending to contacts on email lists who geographically could never use your product or service, it’s a complete waste of time and effort. On the other hand, you can amp up the specificity of your offerings and close more deals if you have the right location-specific data. This information is powerful and extremely useful. For example, if I live in Brooklyn, New York, I should receive invitations to a company’s store opening or promotional event in the tri-state area, but I should be exempt from updates about locations geographically far away. It seems like a simple fix, but you would be amazed at how many businesses overlook geographic segmentation and suffer the consequences. Consumer demographics are useful metrics that encompass information such as a person’s age, gender, job title, and annual income. Demographic segmentation becomes more advanced depending on how much you can get your prospects or current customers to reveal at sign up. Depending on the type of business you are, different demographics will be more important or less significant to you. For example, a clothes or cosmetics retailer would clearly benefit from knowing a prospect’s gender, whereas a website design agency would be more interested in someone’s job role to pinpoint potential clients’ industries. Psychographics is just a fancy term for your subscribers’ stated preferences related to personal interests and activities. Information about customers’ opinions is valuable in helping you cut through the noise by targeting your audience based on their real interests. This data could have come from forms, surveys, quizzes, or by referencing their social media profile descriptions. If you have the data, then it means at one point or another, current or potential customers explicitly articulated their affinity for a certain product or service. For example, let’s say I took a survey before completing my check-out at an online clothing store. If I express that I have a tendency to buy casual wear and rarely purchase formal attire, then it would make sense for that store to avoid sending me too many promotions for gowns or pant suits. Instead, the store should include me in a segment for discounts on jeans and tee shirts. Using psychographics, you can craft complex buyer personas. This information will expand your targeting options enormously. With a digital marketing platform that has a comprehensive data warehouse like the Chainlink Marketing Platform, segmentation options are endless. If you want to truly optimize your email campaigns, segmenting based on a customer’s behavioral patterns related to his or her purchase history is key. You can segment customers by product purchased, category of product purchased, price of product purchased, etc. E-commerce companies benefit greatly from this kind of segmentation because they can closely predict when a customer might run out of a certain product and want to reorder, thus sending a perfectly-timed email suggesting to buy more. Creating segments based on a subscriber’s behavioral patterns can be a more advanced tactic. Some strategies even consider webpage visitors’ scrolling behaviors, buttons or links clicked, menus visited, or time active on a webpage. It’s all possible with the Chainlink Marketing Platform. This information can improve email campaign success because you can send subscribers more emails similar to the ones they engage with the most. For example, if you notice certain subscribers always open your company’s email and watch the accompanying video when “VIDEO” is emphasized in the subject line, then you should always send an email with that kind of subject line to those subscribers. Using Chainlink Marketing Platform’s advanced segmentation features, you can target your contacts based on past behaviors and interactions, helping to ensure you have a successful campaign. Using a combination of these four pillars of segmentation will have the greatest impact per subscriber affected. Your contacts need to engage with the emails you send them and marvel at how well you know them. Personalized segmentation is a huge driving force in increasing engagement. Naturally, some segments can be extremely time consuming or costly to create. 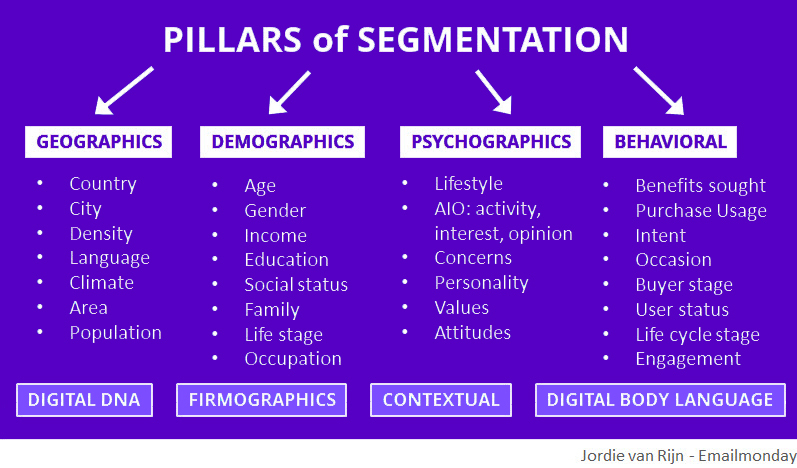 When you are deciding on segmentation models, the only way to know what works and what doesn’t is by testing and tweaking your segments repeatedly. When you use a digital marketing platform like the Chainlink Marketing Platform to create segmented email lists, you will undoubtedly improve your email campaign results. The Chainlink Data Warehouse empowers you to combine any profile, behavior, interaction, or marketing touchpoint from your entire database to create new segments. We can provide detailed real-time analytics and business intelligence about every single email that goes out and the recipients’ responses and follow-up actions. Want to find out more? Request a platform demo below!